RP, Production Manager, is caught hard at work taking care of the courtyard at the Coastal Living Idea Cottage. 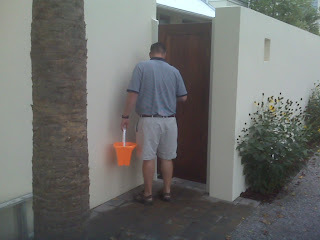 When he saw the fountain needed some attention, he was quick to pull out his beach bucket to jump right in. So glad he was prepared to share his toys for the sake of the team.